Delta Air Lines is pulling napkins from its flights after their attempt to spark romance in the air failed to take off. “Be a little old school. Write down your number & give it to your plane crush. You never know…” said the small print on the napkin. Apparently Delta’s encouragement to flirt with fellow flyers didn’t go so well, with many passenger criticising the marketing stunt on social media. 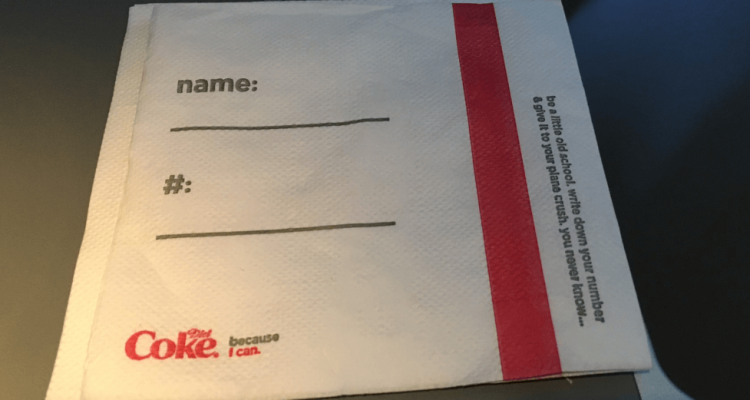 “Hey @Delta and @CocaCola These napkins are creepy AF. Pretty sure no one appreciated unsolicited phone numbers in the ‘good old days’ and they sure as heck don’t want the number of someone who has been gawking at them on a plane for hours today. Not a good look,” one Twitter user shared. “Napkins received from @Delta on Wednesday flight seem unintentionally creepy, especially after reading the smaller print. Swing and a miss, @DietCoke,” said another. In a statement the airline said it had already begun removing the offending napkins from flights.